The Jabra Evolve 30 II UC Repl. Headset is a professional headset, designed to improve conversations. Excellent speakers are built for both voice and music. Switch easily between conversations and listening to your favorite tracks. Simply wear the headset to eliminate high-frequency noise, such as human voices, - all thanks to the specially designed ear cushions. In-line call controller gives you easy access with large buttons and LED indicators. Pick up or end calls, control volume, or simply mute the line. 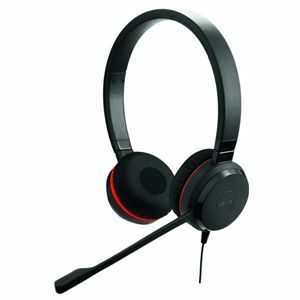 Evolve 30 is a professional headset designed to help you focus and improve your conversations. Works out of the box with all leading Unified Communications platforms. Installation is as easy as simply plugging it in.